We’re just five days away from witnessing the most anticipated heavyweight trilogy in MMA history. 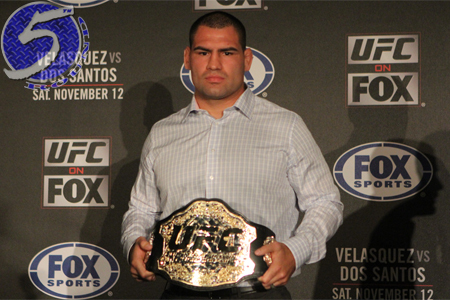 “UFC 166: Velasquez vs. Dos Santos III” showcases the rubber match between champion Cain Velasquez and Junior dos Santos. Bitter rivals Daniel Cormier and Roy Nelson serve as the co-main event. The UFC’s Facebook page kicks off the show by streaming the night’s first four bouts live at 6:15PM ET/3:15PM PT. Fox Sports 1 will then air the remaining prelims at 8PM ET/5PM PT. Toyota Center in Houston, Texas hosts the festivities. Of course, 5thRound.com will be providing live play-by-play and results from Saturday’s show.